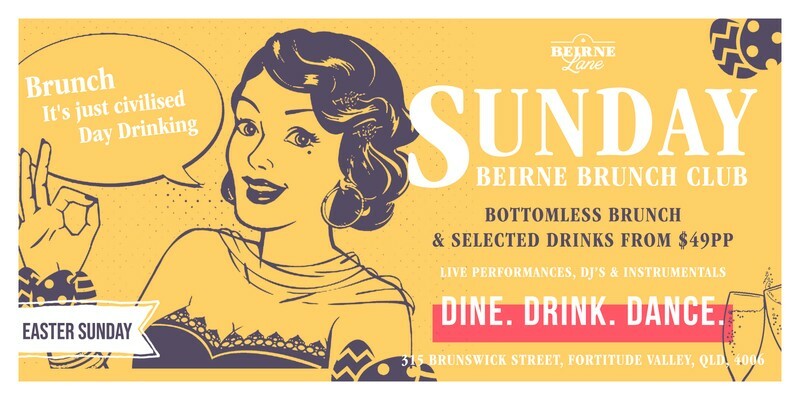 Finally in Brisbane, drawing inspiration from the Brunch Party trend already huge in cities like NYC, London & Dubai, Beirne Lane presents the Beirne Brunch Club. "It's just civilised day drinking" plus a little more. Doors open at 11:30am for a 12pm start: 3 hours of a Bottomless Brunch featuring a smorgasbord of Easter themed brunch delights from our beautiful open kitchen (*full menu below). Drink packages that range from 1 glass of bubbles on arrival to 3 hours of our premium Bottomless champagne selected cocktails, spirits, premium beer & wine. In real Easter spirit, there will of course be lots of chocolate, and an Easter egg hunt. All packages include an all you can eat brunch buffet with live cooking and grazing stations. VIP: Reserved seating - 3 hours of Bottomless Lanson Champagne, tap beer, premium wine by the glass, spirits & cocktails (Aperol Spritz, Pimms Cup, Bloody Mary & Mimosas) + weekly surprise cocktail inclusion.